This is one of the findings from the most recent Giving USA report, which tracks annual giving trends. Who's giving, to whom, and so much more. There's been plenty of reaction to this year's report and the $410 billion milestone. Some are concerned about the sustainability of this level of giving. Can it continue to increase, as it has for the last eight years in a row? There's plenty of data like this and lessons you can learn from the Giving USA report. 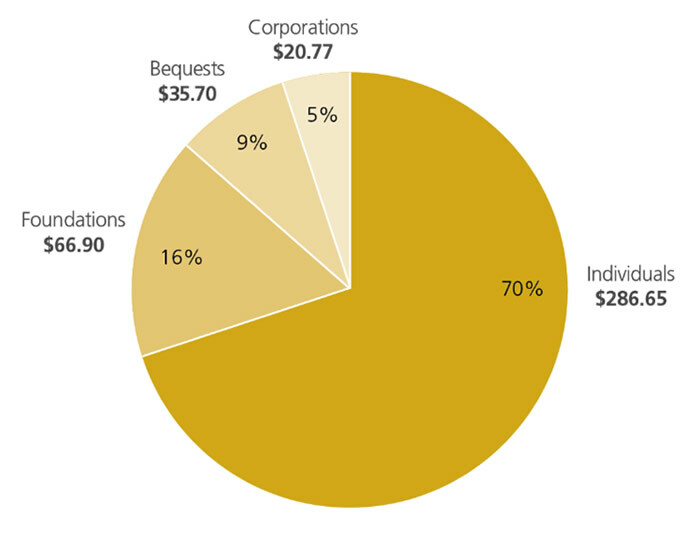 Individual donors are responsible for more than 86¢ of every dollar donated to charity. That represents total giving from individuals (70%), bequests (9%) and family foundations (7.2%). Why include bequests and family foundations in "individual" giving? Because, ultimately, it was an individual donor's generosity that was the basis for those gifts. Of note, there was a flurry of individual and first-time gift activity to groups like Planned Parenthood and the ACLU, immediately after the 2016 election. There was another spike in what's called "reactive giving," in the first 100 days after President Trump took office in January 2017. Today we're seeing record-level "rage donations" in response to the border crisis, immigration issues, and parent-child separations. Not all of these donors have deep pockets, which is proof that even small gifts can make a big difference. Why this matters: Smart fundraisers focus on building relationships with individuals. A strong base of long-time, loyal donors are far more important to your organization than event attendees, auction bidders, or one-time donors. All too often, that's transactional fundraising. To grow, you need to focus on relationship fundraising. 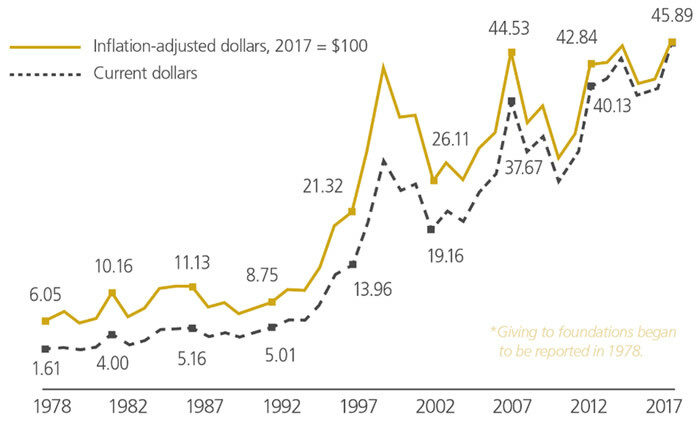 The following chart reflects giving by source (individuals, bequests, foundations, and corporations) over the past 40 years. Notably, the "decline" we see in the growth of individual giving has been offset by the growth in giving by foundations. Why this matters: We're in the midst of an intergenerational transfer of wealth. In the U.S., an estimated $30-$60 trillion in financial assets is expected to pass from one generation to the next, over the next 30 years. A new generation will control much of this wealth, individually and/or through their family foundations. "Religion" includes contributions to churches and houses of worship and other religious programs. For the past 40+ years, Religion (as a subsector) has received the largest amount of charitable gifts. However, the percentage of dollars that are going to Religion is declining. More importantly, the number of Americans who affiliate with organized religion is declining. Why this matters: People who self-identify as "religious" are more generous - to both religious and secular causes - than their non-religious counterparts. If fewer people are "religious," this could affect overall giving. As one example, we're already seeing a decline in the number of households who give to charity each year. Charitable giving tends to follow the stock market. In fact, there are statistically significant correlations between total giving and the S&P 500 Index. Now understand, people don't stop giving altogether during a recession. However, during a strong market, they tend to give more. Also, when the markets are booming, foundation assets grow. Individual portfolio values increase. Large donors tend to give more in good times - to their foundations as well as directly to causes they love. Small and mid-level donors also give more when the economy is strong. When Americans have more confidence in the economy, many feel like they have a little more money to share - and they do. Why this matters: The stock market is an indicator of financial and economic security. 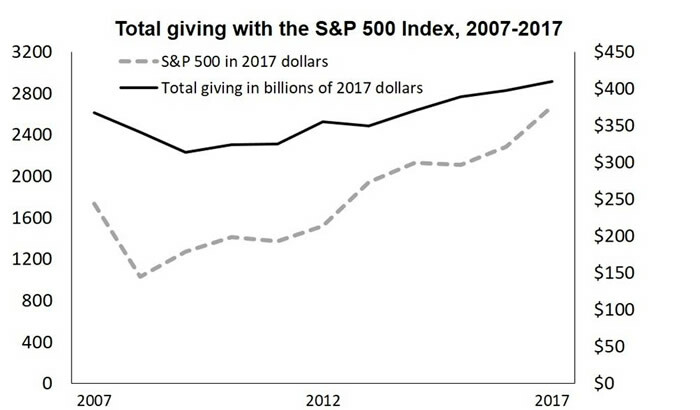 When the markets are bullish and the economy is strong, donors of all giving levels are more generous. In 2017, Bill & Melinda Gates, Mark Zuckerberg & Priscilla Chan, and Michael & Susan Dell contributed a combined $7.5 billion to their own foundations. Donor-advised funds (DAFs) are also growing in popularity - and in assets. The dramatic increase in donations to foundations and DAFs could be in response to the expected changes in the IRS standardized deduction. Regardless, some people have complained that billions of dollars were "parked" in foundations and DAFs rather than being donated outright to charitable causes. Why this matters: When individuals give to their foundations or DAFs, it's not a loss for the sector. The funds will ultimately trickle down. Plus, In years when the stock market is down, foundations and DAFs will have ample funds to continue to support nonprofits. When you understand what's happening in the sector, it can influence what you do within your organization. Continue to focus your fundraising efforts on individuals. Specifically, think about long-term relationships, not one-time transactions. Focus on donor retention. Remember, the best prospect for a gift is a current donor. Implement strong stewardship practices and show lots of #donorlove, especially to first-time donors, long-time and loyal donors, and very large donors. Donors support causes that are important to them. Think of your organization as a bridge that connects a donor to the things that are important to her. Remember, donors don't give to you, they give through you. They don't give because you have needs, they give because your organization fills needs. Always keep in mind why individual donors give, then give them a reason to give to you. Want more data and insights from the Giving USA report? Watch this free 1-hour webinar from Nonprofit Quarterly. Need help creating a stewardship plan, to keep your donors? Or a fundraising plan, to attract new ones? Laura Rhodes can help.